Carleigh's birthday is just over a month away and I'm not quite sure how we're gonna celebrate it this year. For her 1st birthday we had a big party and invited a lot of people. I went all out for it. It was wonderful and beautiful and I'm so glad that we celebrated the way that we did but....a part of me was disappointed in the turnout. It really upset me at the beginning of the party until Anthony said that this party was about Carleigh and not anyone else. He was totally right and I kinda shifted my focus off who didn't come to having the best birthday I could for my little girl. I've contemplated having something small and leaving an open invitation to anyone who wanted to join us or just having it be me, Anthony, and the girls. I know I would like to get a cake made by the same lady who did it last year and I want to release some balloons but other than that it's all up in the air. I'd love suggestions if anyone has any! Do you have a small or big miracle that has brought you hope lately? 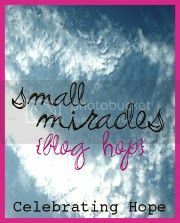 Link up with Franchesca and share with others on her blog hop of hope entitled Small Miracles. Have you ever read the books by SQuire Rushnell that talk about Godwinks? I've only read one of his books in the When God Winks series called When God Winks at You. 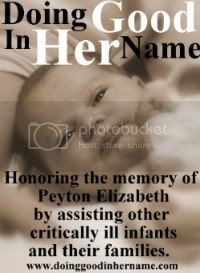 It was given to me by family friends when I was hospitalized for a week after having a pretty bad bleeding episode when I was 26 weeks pregnant with my daughter, Kyndra. I took a liking to the term Godwink. In his own words a Godwink is "a personal signal or message directly from a higher power, usually but not always, in the form of a coincidence." I just love the idea of Godwinks and I've had my share of them. But what about our children? Can they send us little winks too? I like to think that they can, but I've never been too sure. On the evening of the Super Bowl we went to the house of a couple we are friends with at church. We ate dinner there and enjoyed each others company along with our Pastor and family. It was a really good evening. 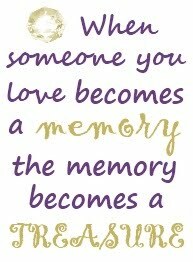 Like many times each day, I had moments where I thought of Carleigh. Then out of nowhere I had my very first Carleighwink. Sure, I've had times when I saw something and thought of her but never moments that just couldn't be explained. I had Lainey on the floor and was changing her diaper. I was wearing my necklace of Carleigh's that I do almost every day. 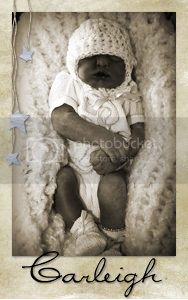 On the necklace is a pendant with Carleigh's handprint and footprints. Lainey is always grabbing at my necklace and while I was leaning over her it was hanging and she grabbed onto it. She had a hold of it for several seconds and then the pendant came off in her hand. At first I thought it had broke and was a little upset but when I took the pendant out of Lainey's hand I noticed that the small ring that holds the pendant onto the chain of the necklace was intact and perfect. I checked the necklace to make sure it had not broken and it, too, was perfect. There is absolutely no explanation as to how that pendant got off my necklace. Believe me, I've tried to explain it logically and I can't. That moment was my little Carleighwink and I hope that she sends me more. 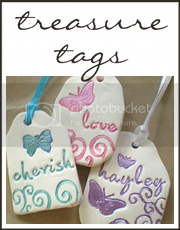 Just a short post to announce the winner of the infinity necklace from my Steadfast Love post. Congrats to Amanda at A Little Bit of Hope!! I sent you an email! Thanks to everyone who read my post and left a comment! I hope everyone has a Happy Valentine's Day! 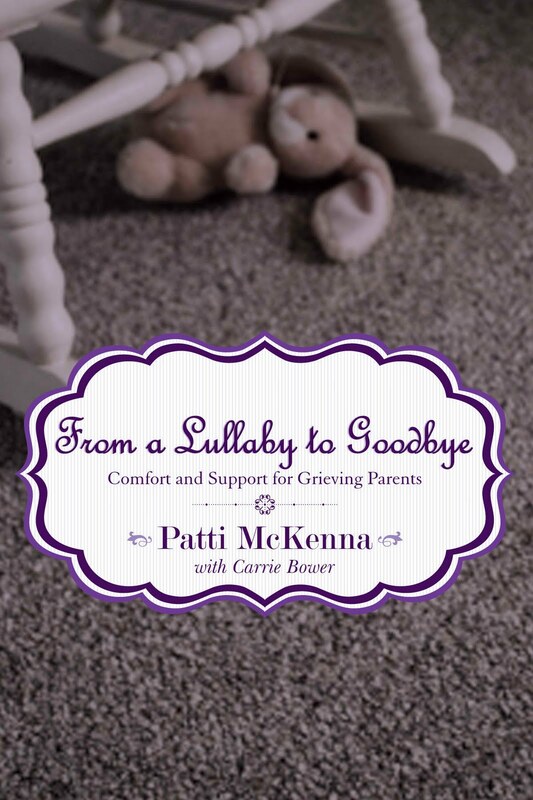 From a Lullaby to Goodbye is a book by Patti McKenna that is a compilation of over 2 dozen people who have experienced the loss of a child. 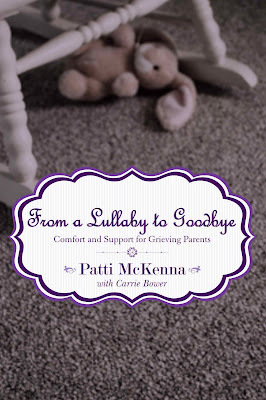 The purpose of the book is to make sure no parent feels alone after such a loss. 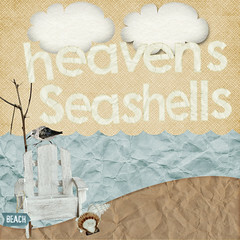 In the book you can find stories, experiences, and poems. I had the privilege of being able to contribute to this book. 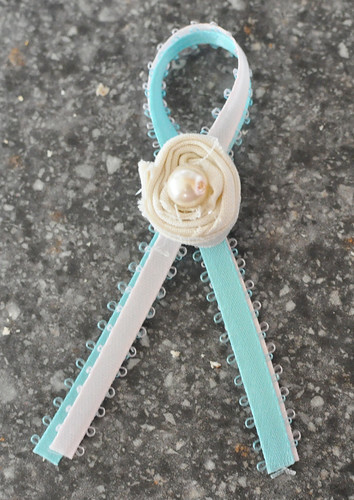 I submitted Carleigh's story hoping that someone could benefit from reading it. As of right now just the e-book version is available for purchase through the blog but hopefully in the near future a print version will be available. To purchase the e-book for $9.00 just click here. 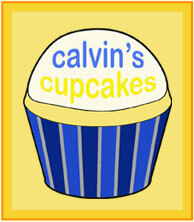 The e-book will also be available through Amazon later this week. I'm joining Mattie and many other wonderful bloggers in writing a post about love for the month of February. 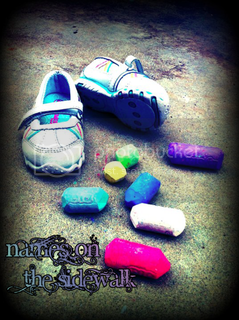 Mattie will be leaving a link every day to the post on love so stop by her blog and check it out. She'll also be holding some giveaways this month. Growing up, I loved my mother (and still do, of course). My sister and I had the privilege of having a mother who stayed at home. She was there when we left for school and there when we came home. She drove us around from here to there, played games with us, and cheered us on loudly at games (and so much more!). She did so much for us. I have no doubt that while being our biggest advocate in the bleachers, she was also our biggest advocate to God. I'm sure she spent countless hours on her knees praying for us, especially as teenagers and young adults. Sometimes I didn't get my mom. Sometimes I thought she was unfair, mean, and even stupid. I was ready to break away and find my own place in the world and she let me. I've made mistakes-big ones-but her love has never wavered. I don't think there's anything that I could do that would change that. My mom's love for me is just a glimpse of God's love for me. 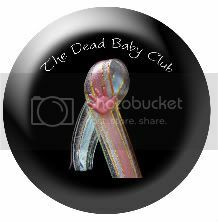 I remember the moment I saw the little flicker on the ultrasound screen of my own baby. My heart grew with a love I had never experienced. As my little baby grew within me that love within my heart also grew. Then I gave birth and held my child in my arms. Every fiber within my being loved that child and would do anything to protect her. I finally understood my mom and I had a new appreciation for her and a new understanding of God. The love of a mother, like God's love, knows no limits. My love for my children, whether on earth or in Heaven, is deep and will never fade. My children on earth will grow and make mistakes. They will test my patience and make me angry. But my love for them surpasses it all. I believe that God's love for us is much deeper than the love a mother has for her child-deeper than we can fathom. Can you grasp a love that deep? God's love is the one true love. It is steadfast and strong and cannot be broken, shaken, or changed by anything that we do. We don't deserve God's love but He gives it to us freely. I think God took some of His own love and placed it into the heart of a mother. A love that is steadfast from the very beginning. I have something I'd like to give away in honor of both a mother's love and God's love. It is a sterling silver necklace with white sapphires arranged in the shape of an infinity symbol-just like the infinite love of a mother and God. I hope that whoever wears this necklace is reminded of a love that never ends. To enter just leave a '♥' somewhere in your comment. That's it! I'll keep this giveaway open until Valentine's Day, when the winner will be announced.